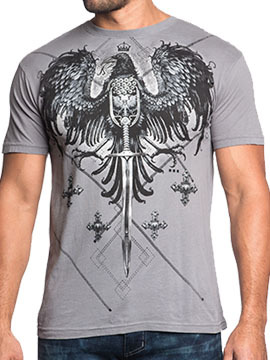 Xtreme Couture Nexus Optimus men's short sleeve t-shirt features a large black falcon with a medieval sword, shield with lattice and silver crosses below. The back features the Xtreme Couture logo with a medieval sword, silver crosses, lattice work and bird talons and feathers near the shoulders. 100% cotton, light weight, vintage slim fit. Garment dyed with silicon wash for soft feel. Color: charcoal grey. Xtreme Couture is produced by UFC Championship MMA Fighter Randy Couture and Affliction Clothing.